How can a blogger use Pinterest for blog promotion? The following points were observed by me on what made to click on a PIN to read further. After all, this is the success of the said pinners in Pinterest and I must pay rich accolades on their creativity to PIN an image on correctly named boards and the compelling title that force you to click on. 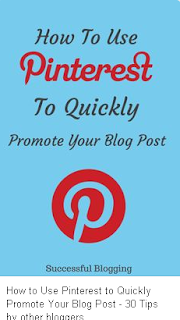 When I started composing this blog post, I thought I would show at least 5 PINs on which I clicked related to using PINTEREST for blog promotion. Now, I realize I am not able to do that because, I have collected and saved as many as 23 PINs on the topic of my interest. One thing I can assure you that PINTEREST can be anyone's ultimate content curation tool. I forced myself to pull away from Pinterest. Oh, let me at least show blow a PIN. I am sure you will click on it to read what is inside. Note: I am not the authors of the PIN.